In my decades as a police officer, I worked with quite an assortment of cops. Many of them were very good cops, some were not; we all had flaws and made mistakes. One guy who I thought highly of had a penchant for pepper spray. He used more pepper spray than the rest of the department combined; however, this probably wasn’t a bad thing. He was a very active cop, he made a lot of arrests, and they were good arrests. He was also a small guy, short and thin. So, if someone wanted to get physical with him, instead of pushing the suspect around, twisting his arm, rapping him one, this cop would just dose the suspect with pepper, then put the cuffs on him. Not a bad approach, by any means. So, this must have been in the late 1990s, because I was the evening shift tour commander at the time. As the lieutenant in charge, I spent most shifts running the show from the communications center, doing scheduling, answering questions, and so forth. But, a couple of times a month, I spent the shift on the road, essentially swapping places with one of the sergeants. One such evening, one of the local police departments asked us (the county police) to help them maintain order at an unanticipated demonstration. A group of foreign diplomats and officials were dining at a local restaurant, and members of a minority group from that country were protesting the nation’s policies outside. There were about two dozen demonstrators. I arrived with about four or five cops, and the town had about the same number there. One of my guys was the master of pepper spray. When it was time for the group of diplomats to leave, we arranged to have their car come right to the door of the restaurant to pick them up, and set up lines to keep the boisterous demonstrators back. The well-dressed diplomats dashed into the car, and as the door was closing, a demonstrator near me cocked his arm and hurled an egg at the car. A few more followed suit. With the diplomats gone, the demonstrators quickly dispersed, and so did we. I was walking back to where we had parked our cars, walking with the master of pepper; I may have teased him about not having had a chance to spray anyone. He took the spray can from his belt, and said he just had to get it out of his system. He pointed it away from us, and sprayed a short burst. I think that’s kind of a cute story, and it can stand on its own. But I can’t resist mentioning that I also like this story because no one was hurt. The demonstrators weren’t violent — throwing eggs at a car after the doors closed was obviously intended to be symbolic — and the police didn’t initiate violence either. No one got peppered except me. Now, I think we have all seen police-initiated violence, particularly when political demonstrations are involved. Do you remember the violence unleashed in the south during the civil rights protests of the 1950s and 1960s? The fire hoses, police dogs, and simple brutality of the police? Are you old enough to remember watching the Chicago police riot of 1968 on TV? I remember watching in horror as a mob of club-weilding cops chased and viciously beat young people. I remember four dead in Ohio. In fact, I remember that this sort of policing was a big part of why I became a cop in the first place. There was a widely recognized need for police services to become more professional, more restrained. Better educated cops would be less physical in their work, more thoughtful and courteous, more respectful of civil rights, and would gain the respect and cooperation of the communities they serve, allowing our society to move closer to its democratic ideal. By becoming a police officer, I felt I could become a foot soldier in the ongoing American Revolution and help build a freer, more secure republic. The video I linked to from the well-known incident at the University of California at Davis isn’t the most commonly viewed version, and it probably doesn’t show the abuse of pepper spray as shockingly as the shorter version that more people have seen. However, I would like you to see what happens after the pepper spray incident, as the crowd chants, Shame! Shame! Shame! and the police form a defensive circle, and start to retreat, weapons at the ready. Look at the police; they are deeply confused, and I think that their confusion is much deeper than What do we do now? In watching their faces and bodies, I cannot help but think that they don’t understand why they are being shamed, why they find themselves in a defensive circle against hundreds of angry, chanting students, how they have violated the social contract and set themselves apart. They really don’t get it, and to understand why they don’t get it, you have to dig deeper into the YouTube trove of footage and see that the police actually conducted themselves with exemplary professionalism; they were pretty much perfect, except for the fact that they committed an assault and inflicted torture on peaceful demonstrators. The calm, professional manner in which they inflicted this assault, in the context of their otherwise impeccable conduct, demonstrates that they were acting in accordance with their training and orders, orders that anyone outside their culture could see were immoral. This insularity and isolation of the police, and the cognitive disconnect with the rest of the university is right out there at the end of the video, as the crowd of peaceful students surrounding the armed and armored police begins to chant We are giving you a moment of peace to leave here! Leave here! Leave here! and the cops look at each other, lower their weapons, break their formation, and walk away. On the other hand, anyone who watches video of the New York Police, and delves into what’s available on YouTube, will have to conclude that NYPD holds the public in contempt, do whatever they want, and are as scary as anyone in New York. Those are strange things to hear from a retired cop, and there are some who will find this page who will be angry and call me names, like “communist”. I am not a communist, (not that anyone is anymore) I am a community-ist. I am writing this blog because love is the fundamental principle and law of existence, and that which goes against love will cause suffering and then crumble to dust — and this certainly applies to societies, civilizations, and nations. Community and compassion are the outward expression of love. If we don’t stop yelling at each other, dividing ourselves into factions, and spraying caustic aerosols on people we disagree with, the United States of America will crumble to dust, accompanied by great pain. We must hold onto each other with fierce affection and compassion. You may recall that when I last posted, I was going down to Occupy Wall Street with other Quakers. 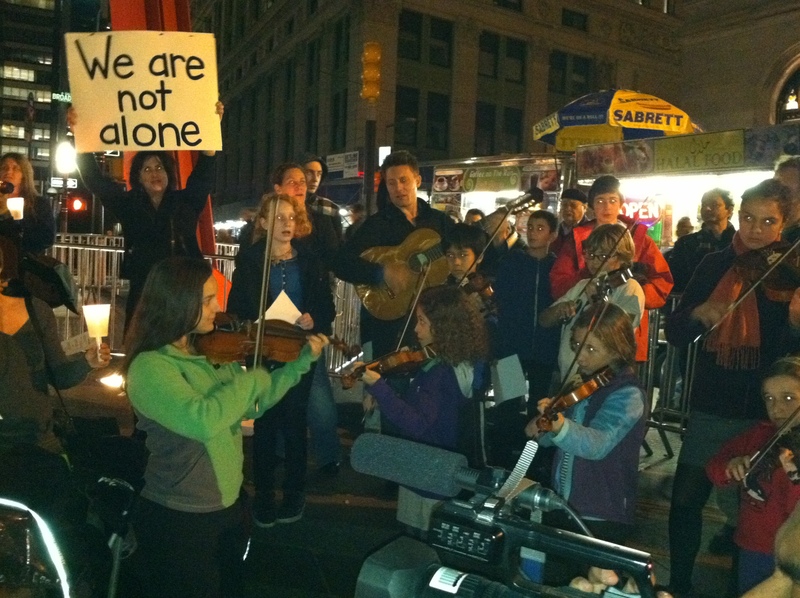 We held worship in Zuccotti Park, met people, distributed leaflets. (I distributed an excerpt from my last post, “We Are the 100%”.) A group of school kids showed up with violins and led the crowd in singing “We Shall Overcome”. When I was on my way into New York, I got a text message from my wife, who had been on the phone with our son, who is at law school, far away. The message said, He said in a serious tone that he wants you to be careful today. He mentioned the U. Cal. protest. This made me smile, on many levels. I was deeply touched that he was worried about me. I was also amused at the role reversal; it’s supposed to be — and always has been — me telling him to be careful. Then he sent me a text message, too. It said, Be careful of the fascist enforcers of the oppressive corporate oligarchs. I hear they like putting hot sauce on pacifists and eating them …. I hear they go for the arms first — pacifist arm meat is especially tender from never throwing a punch or holding a gun — kind of like veal.